Need help with your new barn? Here's where you'll find prefabricated barn doors, cupolas, weathervanes, door rollers and forged hardware, metal siding and roofing, carriage house style overhead garage doors and builders who can help you put it all together. 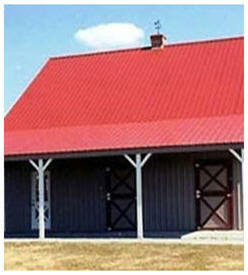 Steel Roofing from Absolute Steel Put the best roof on your new barn. Get immediate pricing, job-site delivery, a complete analysis of your roof with plans for panels, trim and flashing, and even a do-it-yourself installation manual. You'll be surprised at the reasonable prices and great customer service. Ask about metal siding too. Visit MetalRoofingSource.com or call 877-833-3237 right now. Old-Time Barn Door Hardware from Rockler.com Are you looking for flat track hangers for traditional sliding barn doors? You'll find attractive, practical, durable old-style barn door rollers and track, strap hinges, clasps and latches at Rockler.com. 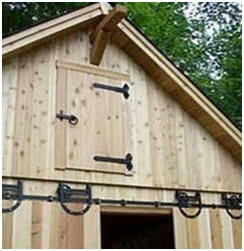 This classic hardware will give an "old style" look to your barn, carriage house style garage or shed. The Country Gentleman® - Cupolas and Weathervanes This on-line magazine and catalog has dozens of attractive classic wooden cupolas with attractive prices too. Find the perfect size and style for your barn, garage, shed or workshop. Check out their Country Store to find the perfect weathervane design from a large assortment of themes, materials and finishes. 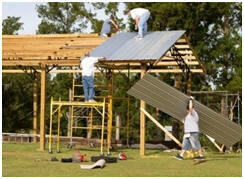 National Frame Builders Association This organization of professional builders are the experts at pole barn building. Visit their site for information on modern post frame building and to find builders in your area. Construction Engineers for Building Department Help The National Council of Examiners of Engineering and Surveying links to the the websites of Licensing Boards for all US states. Many states list all licensed Professional Engineers. Use this resource to find a P.E. in your area who can review, modify and stamp your plans for building department approval. Barn Contractors Here's a list of US and Canadian barn builders and restoration experts maintained by The Barn Journal. Use it to find the best contractors in your area. Post Protectors Post-frame construction has permeated every facet of American life. You could even say it’s fast becoming “The American Way.” And Post Protector™ is right there to back it up. Woodstar Products Woodstar features a superior line of custom barn doors, great for giving a distinctive look to your barn or outbuilding. Constructed mainly of Southern Yellow Pine, they offer a wide variety of wood choices such as Cedar, Oak and Maple. Factory Direct so custom style and size is our specialty! Sliding and swinging hardware is available in galvanized, black or green. Call (800) 648-3415 for a free catalog and details. Buy Barn Style Garage Doors Direct Buying brand-name overhead garage doors is easier than ever at DoorsOn-Line.com. They deliver nationwide. You'll get in-depth information, great prices, free brochures, fast delivery and a satisfaction guarantee on top quality traditional panel doors, elegant carriage-house style doors and vertical plank barn-style doors. Easy-to-follow directions are available for do-it-yourself installers. Timeless Timber Frames Read why you should consider a timberframe barn or home and how to find timber frame designers and builders who will help. The Timber Framers Guild Informative articles and links introduce you to the modern practitioners of the ancient craft. Build a timber frame barn or home and it will last 300 years. Fine Quality Hand-Forged Hardware from Fagan's Forge Add authenticity to your restoration project. Add beauty to your traditional barn or carriage-house style garage. Order museum-quality, wrought iron hinges, latch sets, slide bolts, handles, printles, barn door stays, hand made nails and more. BarnDoorHardware.com This site is dedicated to those hard to find unique barn door, hinges, latches, rollers, track and accessories. It's a great source for old-time flat track barn door rollers. This website has been developed specifically to answer those hardware and accessories questions that are difficult to get experienced guidance on. Hahn's Woodworking Manufacturer of traditional wooden garage doors, carriage house doors, sliding barn doors and custom entrance doors. Richards-Wilcox Hardware Since 1880, Richards-Wilcox has been a leading manufacturer of hardware and door accessories for slide, swing, and slide-fold doors used in barns, stables, contemporary buildings and historic buildings, too. National Manufacturing Co. Overhead garage door hardware, box and round rail track and rollers for sliding barn doors, gate hinges, latches and pulls, screen door hardware, brass door and cabinet hardware, and a full line of home hardware. Carriage House Doors Carriage House Door Company combines old-world design with state of the art technology to replicate beautiful, period-style doors that compliment both new construction and tasteful retrofit. Wrought Iron Strap Hinges Save on gate and barn door hardware at VanDykes.com. 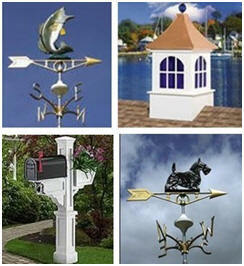 Cupolas & Weathervanes Since 1976 - Hundreds of Cupolas and Weathervanes, Banners, Arrows, Roof Caps and Finials. Horse Stalls & Accessories at Menards Find everything you need to complete your post frame horse stall project and save BIG with Menards. RAMM Horse Fencing and Stalls Horse stalls are our specialty. We design and fabricate a wide range of horse stall systems for horses and other livestock, including custom, designer and portable horse stalls.